It's popular to poo-poo the holidays amongst many in the minimalist sphere. There are the usual downer arguments about how the holidays are simply about buying stuff we don’t want with money we don’t have to impress people we don’t like. There is the (totally valid) argument about how we are teaching our kids to equate love with stuff. There is connection between the holidays and the rampant consumerism that is destroying our planet. But who said that is how we have to celebrate? Here at New Minimalism, we have a happier take on the holidays. Now that Kyle and I are both many years into our minimalist lives, I have to say that the holidays feel less like something to rebel against and more like something to embrace. Our families and loved ones honor the simpler ways we like to celebrate, and -- in many scenarios –– have adopted a number of these rituals themselves. There are so many ways to celebrate the season and those you love that needn't involve credit card debt or mounds of unneeded plastic junk. There is music and sitting by the fire, there are meals to share, crafts to create, laughs to be had, and even the occasional lovely object to share. My favorite way to decorate for the holidays is just to use lights in fun or unexpected ways. We have a strand of globe lights that we hang over the mantle, fairie lights winding up the stems and leaves of our potted plants, and candles spread liberally throughout the house. With so much of our time at home spent with it dark outside, it makes this time feel cozy and special. Bonus? If you happen to be really busy around the holidays (like maybe you have a brand new baby at home) no one will notice that your “holiday decor” is still up as this fits for the whole dark winter season. Other elements that automatically make a space feel festive? Music (I’m a sucker for Holiday Jazz, The Nutcracker, and my pandora Bing Crosby/Frank Sinatra holiday radio station) and delicious smells (like simmering spices on the stove or naturally perfumed candles and incense like these). I’m not crafty. Or I should say: I don’t craft regularly. I don't have a glue gun or spare pom-poms, let alone a craft drawer or cabinet. But every holiday I nonetheless love taking on some little craft project. This year, I decided to put together a tree decoration kit for my nieces and nephews (inspired by this post) as their holiday gift. In addition to sending these elements back home to Chicago, I bought extras and made lovely little strands of popcorn and cranberries for our tree. I also tried out making persimmon ornaments with moderate success (just baked them and ran a string through). Inspired by a group of girlfriends who I made ornaments and pinecone elves with back in the day, I realized that you don’t need to be crafty or have a ton of supplies to make something special. Certainly crafts take time and are a little frivolous, but that's a small part of what makes them so fun. All of this is to say that I long looked forward to sending out cards of my own someday. Yes, it costs money and uses paper and is not the most minimalist of hobbies. But it is a priority, the priority, for me each holiday season. I’d be really sad if I didn’t send a card out and I honor that about myself. This year I decided to procure frames for all of our past cards to act as something of family time capsule (anyone out there happen to have my cards from 2011 or 2013?!) AND to use as decor during the holidays. It's a personal, contained collection that adds a fun bit of meaningful kitsch to our bookshelf, for just these few weeks. My favorite gift to give and receive? Books. Bookstores are my happy place; well-read, thoughtful bookstore clerks hold a place of uniquely high respect in my life. Since my family and my in-laws are all avid readers, I love getting expert advice from the clerks at my favorite local bookstores (shoutout to Books Inc. on Chestnut in San Francisco and Rediscovered Books in Boise). I get to share a few pieces of information--like my dad’s sense of humor, a classic novel he loves, and his adoration of Bruce Springsteen--and then get the perfect recommendation (Barbarian Days, in case you were wondering). Other great gifts to give and receive: things that people really need and are of high quality. For example a killer pair of SmartWool socks for a family member who recently moved to a four season climate or a hand-me-down maternity jacket for when nothing else will zip late in pregnancy. You know, just as hypothetical examples. My very favorite gift-giving tradition arose three years ago and actually didn't include the exchanging of stuff at all. My little sister and brother-in-law's wedding weekend in the fall of 2014 was so full of meaning, tradition, family, and love that it sparked an idea: why is it that we only celebrate one another, only toast to how deeply loved and appreciated our family members are at times like weddings? And so we each randomly selected the name of another family member and at a lovely holiday dinner a few weeks later, we offered up toasts and speeches in each others' honor. It was beautiful. It was sweet. It brought tears and intense snorting laughter. It accomplished all of the things we try to say with gifts: I see you, I’ve been paying attention to you, admiring you, noticing all of the ways you are special, because you are beloved by me, and even if I usually just tease you or ask you to help with family errands, I am so so so glad you are here. What could possibly be better than that? 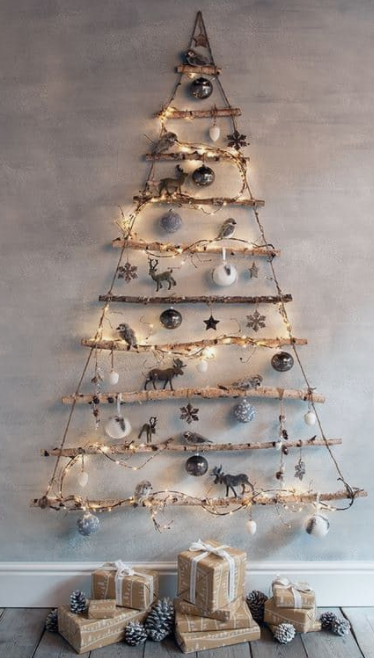 What are your favorite minimalist ways to celebrate the holidays?